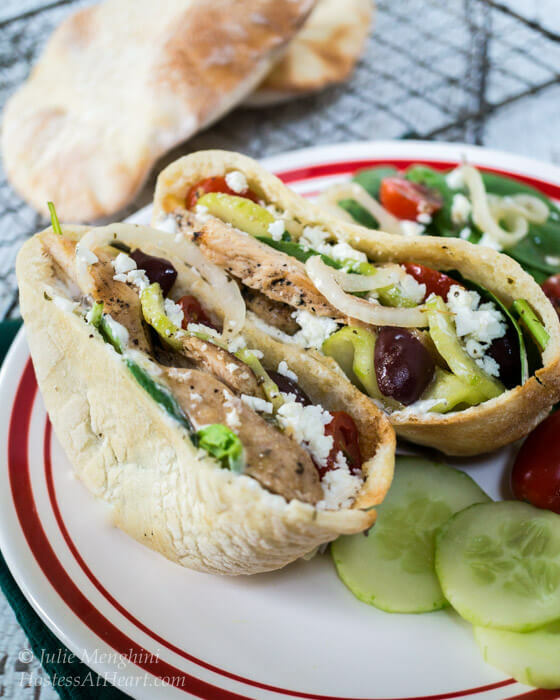 A quick and easy delicious Healthy Chicken Gyro recipe. 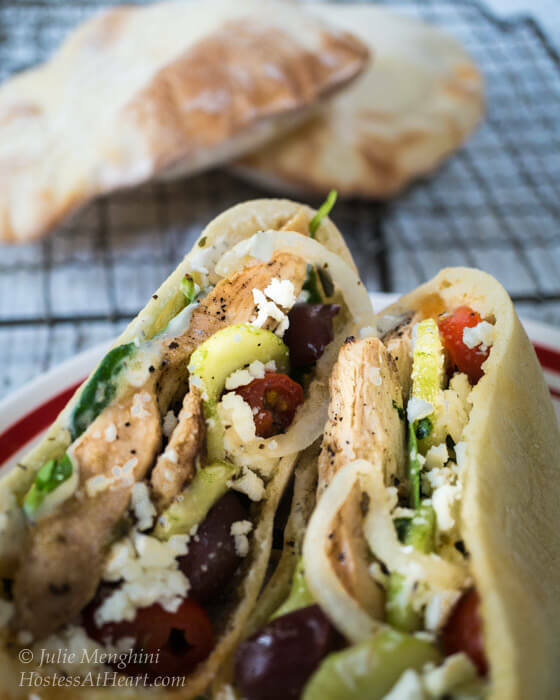 You can either stuff the ingredients into a pita or make a yummy Greek salad. Gyros make a great lunch or dinner! You remember my Pita Bread recipe don’t you? The one that had me high fiving myself and doing a happy dance? 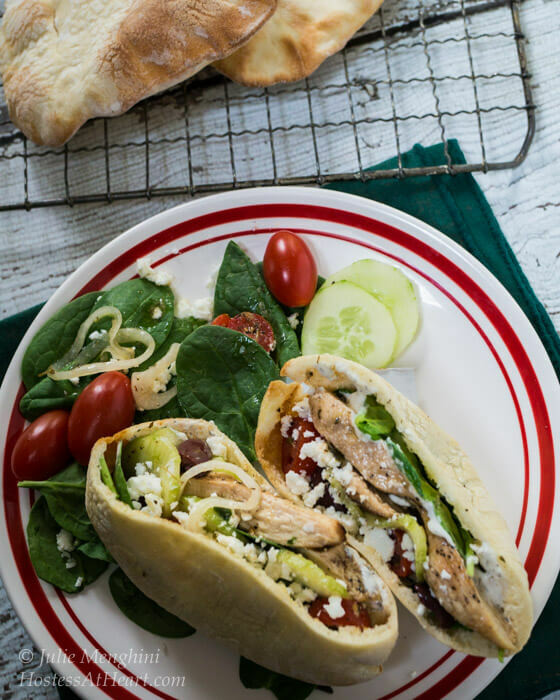 I made those pitas so I could make this delicious Chicken Gyro recipe. Talk about an easy peasy dinner! I don’t know what exactly goes into that cone of meat that you see in Greek restaurants. It’s delicious, but maybe I am better off not knowing. So, when Debbie of The Mountain Kitchen posted her Chicken Gyros, I knew that we would love them. We often go out for gyros for lunch on our summer Saturdays. They don’t leave us feeling heavy or in a food coma. Debbie prepared her Gyros in 30 minutes. I had a little more time so in addition to marinating the vegetables as she did, I also marinated my chicken for a little longer. Debbie had said the longer the better. The other change that I made was her dressing calls for an equal amount of vinegar to oil. I used 1/2 part vinegar to 1 part oil. Lastly, I had some tzatziki that I put inside my pita before adding the ingredients. I’m writing up my recipe instructions, but please visit Debbie for a look at all of her amazing recipes. 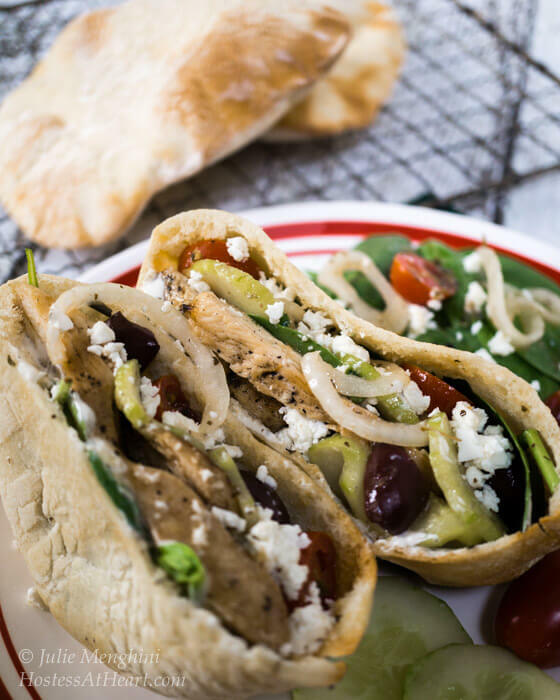 A quick and easy delicious Chicken Gyro recipe. You can either stuff the ingredients into a pita or make a healthy Greek salad. Prepare the dressing by combining all ingredients into a jar or salad cruet. Shake to combine. Combine tomatoes, cucumber, onion and olives in a ziplock bag and drizzle lightly with Greek dressing. Refrigerate 30 minutes or longer. Place sliced chicken in another ziplock bag and drizzle lightly with Greek dressing. Refrigerate 30 minutes or longer. Heat 1 tablespoon of olive oil in a heavy skillet. Add chicken and cook 4 minutes on each side or until done. Set aside and keep warm. Drain marinade from vegetables and add to chopped lettuce. Build Gyro by placing marinated vegetable lettuce mixture in the pita bread. Add chicken and top with Feta cheese. These gyros are a favorite in our family. Here are a couple more of our favorites that are perfect for any meal and won’t leave you feeling heavy or in a food coma! That looks so tasty. I had a gyro for the first time in Seattle. Now I will be making them, thank you. Thank you Donna! I just love them and need to make them again. I like them especially in the warmer months. Gyros are so awesome! I love to add hummus to mine and lots of hot peppers!! I love that idea Jennifer! I’m a hummus lover too! I’m loving this, Julie, especially with your home-made pita! I’ve found it pretty hard to find good fresh pita bread in some areas. I’ve made my own before but was never quite happy with them so I’m looking forward to trying yours. Thank you! I love sharing with your party but have to admit most of the time I miss getting in! I’ve got to get better doing this! These gyros look fantastic Julie!! I too wonder about what goes into those cones of meat 😀 Don’t think I wanna know either! These are a much healthier alternative! YUM! Ha Naina! Homemade is probably always better even though I mush admit that those gyros are so good. 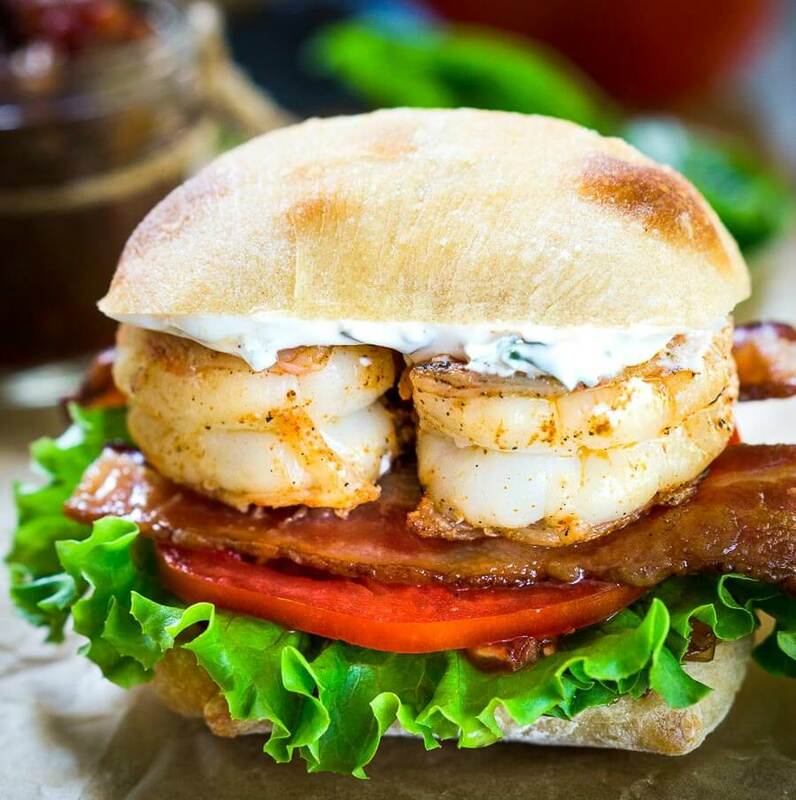 In a pita or on a salad… This would make an amazing meal either way!! Yum! I LOVE gyros, and these look amazing! I recently made my own pitas also, they are sooo much better homemade! Thanks Meghan! I think abut anything is better homemade. I need to make another batch. John loved having them for his lunch instead of bread for a nice change. I’ve just had to look up ‘Gyro’ – that’s what gets called a kebab around me. However, I’m pretty sure we don’t get Greek ones – just really, really dodgy Doner Kebabs from even more dodgy late night take-away joints). 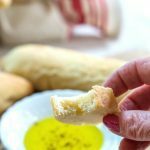 I haven’t had one for years – ever since I’ve been too old to ignore what might be in the meat ;( but now I’m looking forward to trying them out again with your mouthwatering homemade, wholesome version – complete with homemade pitta bread. Brilliant. Thank you so much Jane! I just love the differences in our language. I had to look up dodgy! I’m with you on the mystery meat thing! Thank you Lily! They are so easy and flavorful. Perfect for summer. I love love gyros! 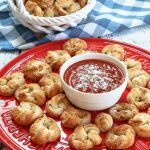 You have made it so simple and easy to make them at home! Thanks for sharing such a delicious recipe! Happy weekend! Thank you sweet Su! I had a wonderful weekend, and hope you did too! Thank you Cynthia! I’m craving it now that the weather is getting nice! oh my goodness i just found your blog and i LOVE it! you have a new fan! Thank you Sarah! You’ve just made my day. I love making new friends, and will be checking out your blog too! Thank you my new friend, and enjoy your day. Thank you Petra! It was so much fun making the pita’s for these gyros. I’ve got to get on it and do it again! I love pitas, but I could always use a new dressing recipe. Thanks! Thank you Jeff! I’m always looking for new ideas too! Love the flavors, colors and textures of this recipe. 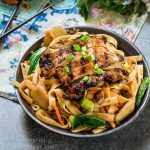 Perfect for serving for a spring lunch or dinner. Thank you Liz! I just love simple meals like this too. You are absolutely right, gyros are always tasty. I love your recipe, lots of colour and they must be delicious! Thank you Judi! Lamb would be amazing too. I have to do that! Thank you for co-hosting this week! 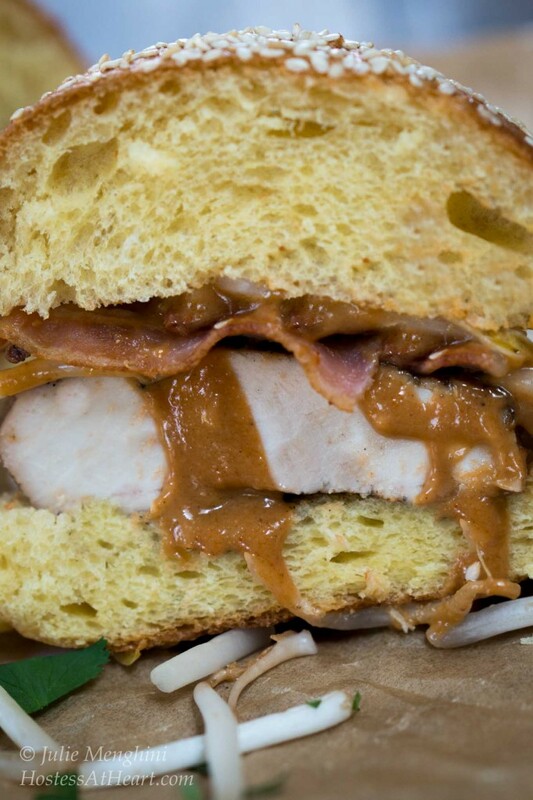 Mmm…I’m wishing I had one of these waiting for me at lunchtime today! I love Greek dressing but for whatever reason, I never thought to try making my own. This looks fantastic! Yummy! I actually just had a Gyro at a Greek diner in Denver CO yesterday- probably the best one I have ever had!! Got to give your chicken one a try! Thank you Linda! How fun eating out in Denver! Is their snow gone? Sounds like a gorgeous and fun time! Thank you Kaila! I have to make those pitas again! Happy FF to you too! Thank you Patti! Hope you are having a wonderful day! 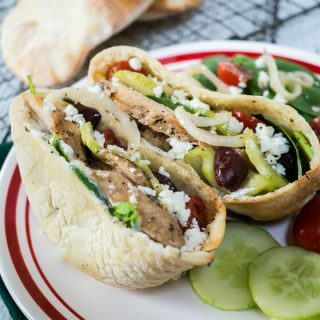 I’m bookmarking this immediately, chicken gyros is something I’ve ALWAYS wanted to make for myself from scratch, pita bread included. Thank you Julie, these looks GREAT. Thank you Jess! Light, quick and easy too! You can’t see me, but my mouth is open patiently awaiting inserting of your delicious gyros. 🙂 Looks amazing! Hahahaha Andrea. That’s funny. Thank you! Thank you sweet girl. These are perfect for out beautiful weather! Thank you Sarah! They sure caught my attention! 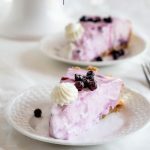 Julie, you are so sweet to mention me and my recipe in this post. Thank you! I was just thinking about your pita bread yesterday and misspoke when I referred to your “naan” bread. Pita bread is what I meant! You’re welcome. 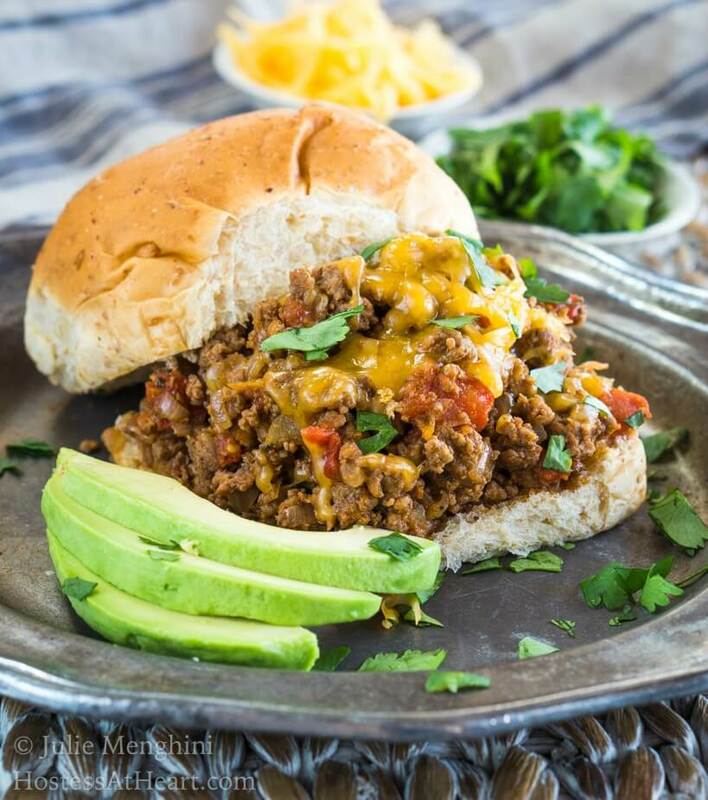 We loved this recipe Debbie! I’ve been hanging onto it since you made them and I can’t wait to make them again. Thank you Sonal! I would have been just as happy stuffing it to the top with veggies. They were so good.